Ham Rong (Hàm Rồng) Mountain is known as one of the famous destinations for tourists when visiting Sapa town. Being shaped like the head of a dragon looming in the veil of the early morning, this mountain is a combination of natural and man-made landscape, making it an attractive destination in the centre of Sapa town. 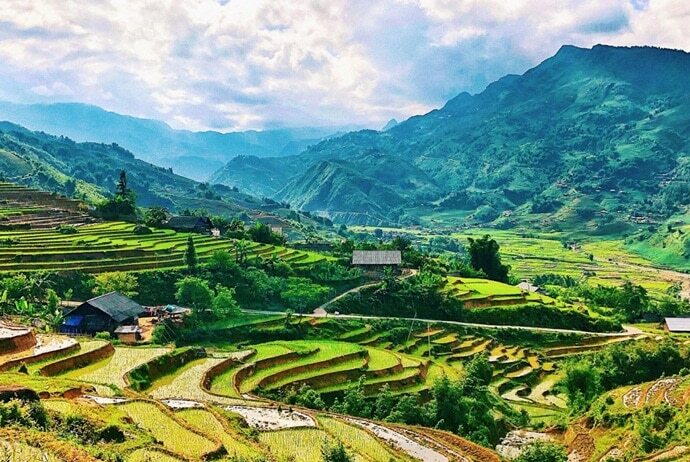 In this article, let’s go with Vina.com and tourists will know some reasons why Ham Rong Mountain is considered as an attractive destination in Sapa town. Ham Rong Mountain is a famous spot of Sapa, which is located in the centre of Sapa town. Ham Rong is surrounded by lots of different types of mountains and forests with broadleaf trees. 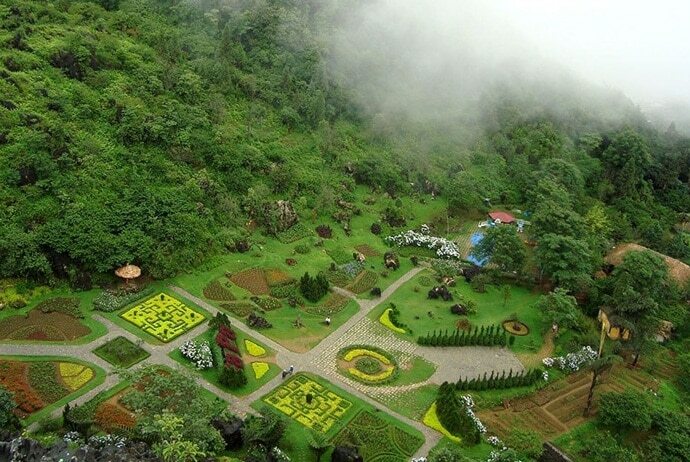 So, the best time for tourists to travel to Ham Rong Mountain is spring. In spring, all of the flowers in the mountain may blossom, hence boasting its beauty and perfume. 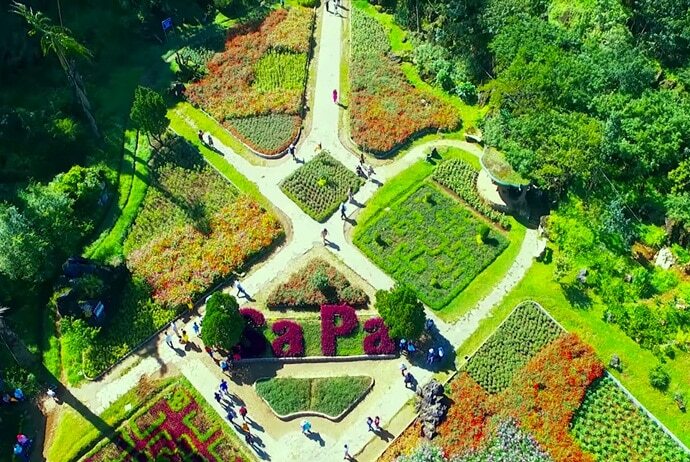 The tourists can see blooming plum, peach and apricot garden. And, tourists can also visit ethnic cultural villages with art-performance by Mong, Dao or Sa Pho young locals. Ham Rong Mountain’s foot is near Sapa church, so you can take a short walk. Also, it takes tourists who stay in Sapa town a few minutes to walk to Ham Rong Mountain. Therefore, if you have a chance to visit Vietnam and Sapa, you should not miss Ham Rong Mountain. When it comes to traveling Ham Rong Mountain in Sapa, you need to know some main features of this mountain. Ham Rong Mountain has an area of 100 ha. The name of Ham Rong was from the legend that there were 2 dragons that were attached to each other while the alluvion was rising high. These dragons hurrily separated from each other, but they failed and then being drifted to different areas. When the female dragon was petrified, it still tried to raise the eyes to the male dragon thanks to its instinct for survival. Another legend about this mountain is that when Sapa was sinking in the sea, there were two brother dragons came here. Their father dragon discovered that, so he called them to come back home. The big brother dragon heard, so he came back home while the little dragon could not hear. When the little dragon came back home but the heaven’s gate had closed. As a result, it must stay on the earth forever and then turned into a mountain. The average temperature of Ham Rong Mountain in Sapa is from 15-180C, and the average rainfall is from 1.800 to 2.000mm. The climate sometimes has a change with the appearance of frost and snow. Ham Rong Mountain plays a vital role in the economic transition of the province. So, it is an indispensable spot for tourists when coming Sapa. When going to Sapa, tourists often climb up Ham Rong Mountain in order to enjoy the cool atmosphere as well as charming landscapes. A lot of rocks in the shape of dragon fin and claws make us think that we are lost in a wonderland. Ham Rong is the home to many kinds of flowers. Wandering stone paths to the wild peach forest, there are orchid gardens with over 6000 orchid plants that belong to 194 kinds. Additionally, there are many exotic flowers along the paths including Lily of the Nile, geraniums, hydrangea, cherry blossom and ox-eyed daisy. Besides, some mountain fruits such as plum, peach and pear are also grown here. The echo sound from bamboo flute and the scenery hidden in the fog make this place become a heaven. The sound of bamboo flutes combined with the dances, songs, folksongs performed by Mong minority boys will leave unforgettable impressions. Conquering San May (Sân Mây) is an interesting activity when you visit Ham Rong Mountain in Vietnam. San May is the peak of this mountain at the altitude of 1800m. From here, tourists can enjoy the whole panorama of Sapa town. On sunny days, tourists can see the peak of Fansipan when standing at San May peak. Along the way to San May, you can drop by Cong Troi 1 (Cổng Trời 1), Cong Troi 2 (Cổng Trời 2) for taking photo and resting. Also, these places offer tourists a great view to terraced fields and French villas below. At these places, you can see the blue sky with white clouds under their feet. When standing on the rocks, you can have a feeling that they are flying. Before coming to the heaven’s gate, Tam Mon cave is also a great destination that many people should not miss. This cave is just enough for a person to go inside. One side of the cave is two cliffs with a list of stone steps while the other side is a blue sky. At the heaven’s gate, tourists can not only enjoy the unique scenes, but they also enjoy the fresh air and get involved in the beautiful nature of Sapa town. Going down from the heaven’s gate, tourists should visit May courtyard at a height of 1,800 m and see the beauty of Sapa valley that is hidden in the white clouds. 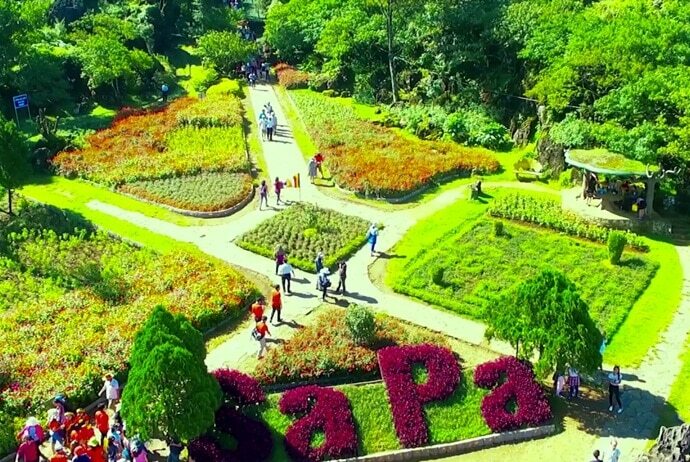 Actually, this is a romantic spot for tourists to experience beautiful images of Sapa. During the road to the peak, tourists will frequently encounter the baskets of Yao girls who gather medicinal leaves and colourful dresses of Hmong women. When you plan to visit Ham Rong Mountain in Sapa, you need to know the following tips. Firstly, you do not give candy, money, or buy anything from children. Instead, you should give them some books or school supplies. Secondly, you do not keep the camera close to the children’s face when taking photo. Thirdly, you should not visit Ham Rong Mountain at weekend in order to avoid the crowded places. Sapa town is known as a city in mist. In the cool and fresh air and beautiful nature of Sapa, standing at Ham Rong Mountain to see the whole view of Sapa town will be an unforgettable experience that you should not miss, especially if you have a chance to visit this city.